Glocks are utterly reliable, everyone knows that. They are arguably the most popular pistol in use in the world. They are in use by military and law enforcement, civilians for self defense and for fun. About the most fun you can have with guns is competition like 3 gun. You can run standard, stock service models and be highly competitive, no doubt about it. But it is a lot easier and frankly more enjoyable to have stuff that works better and is tweaked to meet your desires. 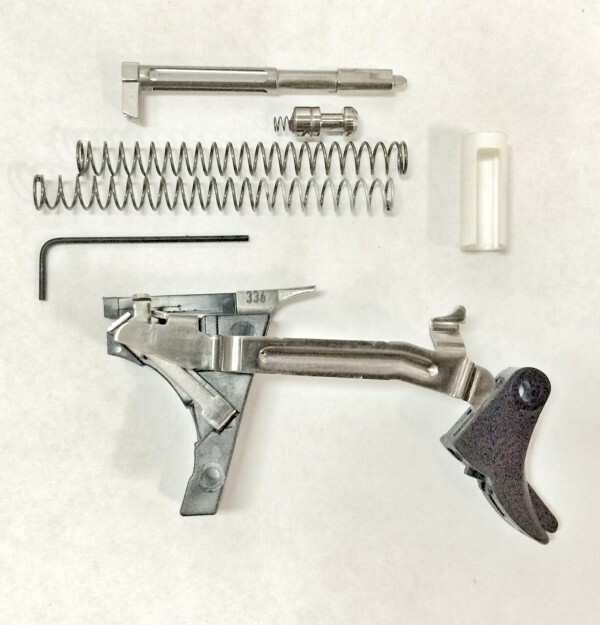 Enter the fun world of Glock aftermarket triggers. Today I cover the DK Custom Glock Trigger.. Recently I built up a Glock Gen 4 34 and decided to outfit it with all the things that make a good pistol great. The two most important are the sights and the trigger. In this case I installed the competition model from DK Custom. Installation takes about 5 minutes, maybe 10 if you haven’t had enough coffee. The DK Custom Glock trigger is production legal and will allow you to set pre and over travel independently with the supplied allen wrench. I like that it uses all OEM parts that are tuned for the application (DK Custom also makes a defensive use version). None of the internal safeties of the stock Glock are compromised in any way. And I did test the trigger without ammo by dropping the gun and smacking it hard numerous times. This is a competition use only trigger and is light at around 3lbs. The spongey pretravel is virtually eliminated and the break is clean with a nice wall you can feel before the trigger breaks. The over travel is very short and the reset is both short and positive allowing you to be right on the wall for the next shot. I ran all sorts of ammo and had zero issues whatsoever over about 1k rounds. Some will say to just use the standard Glock trigger and they will break in smooth over a few thousand rounds. Yes, they do, but they never feel this good and at the cost of today’s ammo it’s really more cost effective just to drop in a good one and go practice with a gun that runs right immediately. During this same time frame I ran a ZEV and GlockTriggers “The Edge” Both are very nice triggers but I thought the DK Custom was just a step above and felt more refined. Yes, I am splitting hairs in “feel” but that is what you are paying for frankly.